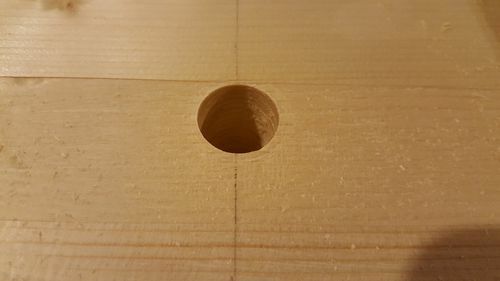 I recently needed to drill 18 round 3/4” dog holes in my Paul Seller pine workbench and because all my bench accessories are Lee Valley/Veritas I opted for their Dog Holes and Bushing kit (http://www.leevalley.com/en/wood/page.aspx?p=72602&cat=1,41637). Out of the box the bit was incredibly sharp and had very pronounced spurs. The fit with the bushing is good and I could only notice a very slight play. 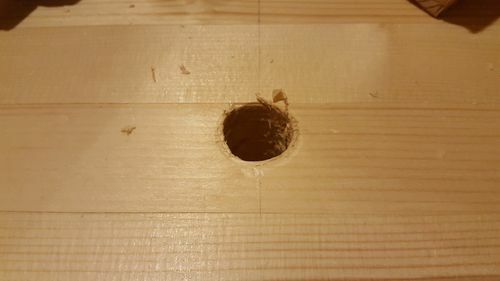 I made my first jig to help drilling the front row of dog holes by slapping a 2×4 over a 1/4” hardboard. A 2×4 fence was added to lock the hole location depth wise. All pieces were glued and screwed to minimize play. The 1” hole for the bushing was drilled using a Canadian Tire Maximum forstner bit because I already owned a set and could’nt justify the $16 CAD for the LV one that is advertised to go along with the kit. My first attempt wasn’t the most successful and on hole #2 I noticed a significant wobble when drilling. After backing out I noticed one of the spurs had broken clean off the bit. The hole was incredibly chewed up on its perimeter and the inside diameter was too big by at least 1/16”. I am still wondering what went wrong. Technique? Manufacturing flaw? My customer experience with LV was outstanding. They confirmed I had indeed purchased the bit by looking at my account and sent a replacement one at no cost. The package was at my door step 3 days after the service call. They also included pre-paid postage to send the damaged one back to Ottawa at the mother-ship. Alignment of the bushing: It all starts by ensuring the bushing is perfectly straight inside the jig. Calibrate your drill press to perfect squareness. Unless you have high end forstner bits you should drill the 1” bushing installation hole using successive bits of increasing diameter. 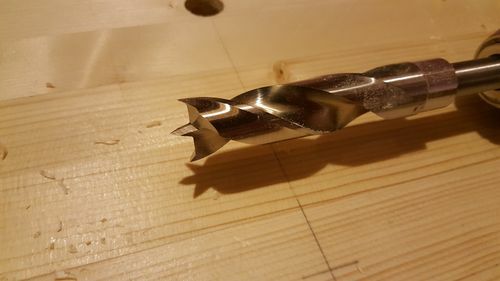 My Canadian Tire Maximum 1” forstner was having a hard time and producing a lot of heat so I first created a ¾” hole using the LV dog hole brad bit and then moved up to the 1” forstner. Using a drill press makes alignment easy. Alignment of the bit: I found that if you are misaligned the bit will rub against the bushing inner wall and wobble slightly. I focused on finding the alignment that created the least friction and found that if you are perfectly square the brad bit will go down a lot more smoothly. 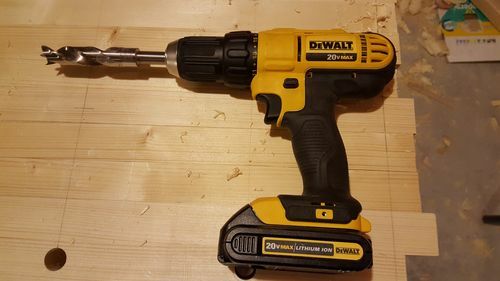 Speed: I initially looked up at a drill speed chart online and the recommendation was that a 1” brad should be used at 1000RPM in soft wood which is relatively slow. Because I was using a cordless drill I chose to dial the chuck’s gear down on my Dewalt (it has 2 speed settings) and entered the wood slowly. What a mistake! The perimeter was all chewed up and chunks of the inner wall came off similar to when you are chopping pine mortises with a blunt chisel!!! My cleanest holes were drilled at maximum speed on my cordless drill. I wanted to try with my corded B&D, but the chuck opening was too small to accept the bit shaft. Lesson Learned – 1000RPM is slow, but only relative to a drill press… not a corded drill! Chip ejection: It helps tremendously if you back the bit out fully and let the chips eject from the hole. When I failed to back out often enough or when I did not fully back out the bottom of the hole would fill with chips and the bit would stop cutting as the spurs glide on the wood dust. Not too long after the wobble would start. Or even worst the bit would cease in the hole and the drill would start rotating on its axis sending me flying. That’s it! Awesome bit after some experimentation! Clean holes that perfectly fit all LV/Veritas bench accessories. Good review. I find it interesting that I had the same experience with this bit several years ago. As it was in your case, the second bit worked without problem. I bought this a while and back and have to say I was 100% satisfied. First bit was go, no issues. Bought in late 2014, iirc. I was rather impressed with the quality of the finished holes, only had one that “wallered” out a bit, but it still works fine. I’ll mark that one up to operator error. Thanks for a great review, and +1 for LV customer service. 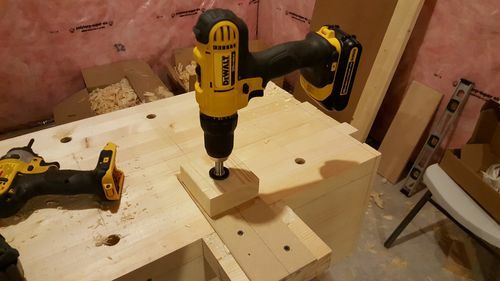 I got the same setup, finished using it last night to drill holes in my new workbench. Quite happy with it. As noted, make SURE that you get the bushing square, or your holes will be out of plumb/square. good settings that enables you to tweak your shower according to best salt free water softener cleansed water makes your skin and also hair healthier great. good complicated whatsoever, as well as there’s no different Mobdro APK a full internet search engine of online video streams. nice. Looking for best cannabis seed bank? Rewies.